Amongst my family and friends, and in my role as a GP, I frequently meet older people with a huge range of caring responsibilities, often for people in different generations and across complex family and social networks. For example, I recently met Margaret, who is 83 years old and the main carer for her son John. John is 56 and has severe disabilities related to head injuries sustained in a cycling accident as a child. Margaret cared for her husband at home through his last illness seven years ago and is also currently supporting her older brother Eric. He is carer for his wife Jean, who has advanced frailty and dementia and is approaching the end of her life. Whilst many people find their roles as carers immensely rewarding, there are also many challenges, particularly for older carers. 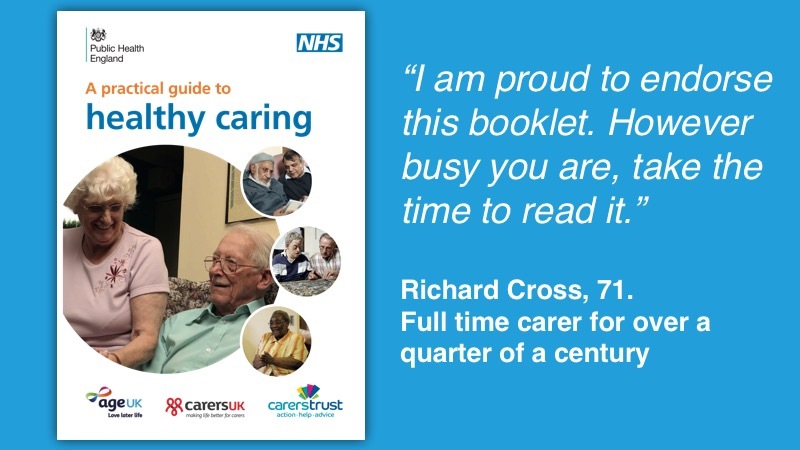 In a moving blog earlier this year, Mr Richard Cross, who is 71 years old and has been a full time carer for his wife for over a quarter of a century, spoke to and for the estimated 1.2 million other carers aged over 65 years in England (Healthy Caring Guide). Richard described the powerful realisation that he holds his wife’s quality of life in his hands and he also wrote vividly about the feeling that he was ‘starting to live two lives out of one body’. Sadly, Richard also described how he has often felt unrecognised and unsupported in his role. So what are we doing to ‘care for our carers’ and improve the support we offer to people like Margaret, Eric and Richard and the millions of other unpaid carers across the country? The importance of the estimated 5.7 million unpaid carers in England particularly in these financially challenged times for the care sector, is now recognised in legislation and policy. The Care Act 2014 introduced new statutory duties to support carers and plans for the implementation of these responsibilities were laid out by NHS England in the ‘Commitment to Carers’ (May2014), ‘Five Year Forward View’ (October 2014) and ‘Commissioning for Carers' (May 2016). Crucially, this high level recognition is now being translated into tangible improvements in the support available to carers and ‘The Practical Guide to Healthy Caring’ is one such development. The Practical Guide to Healthy Caring is designed for the increasing number of carers who are themselves older people and aims to help them make the most out of life. It guides readers through the recognition, acknowledgement and acceptance of their caring role, before directing them towards sources of support. Encouraging carers to looking after their own health and wellbeing is another vital message in The Guide. It reminds older carers to make sure that they find time to look after their own long term health conditions, as well as encouraging them to stay active and adopt healthy lifestyles. The Guide gives advice on coping with stress, staying connected to other people and sensitively helps people to prepare for when their caring journey comes to an end. Finally, it helps carers to draw up a practical action plan to help themselves and brings this right into the ‘here and now’ with the excellent advice ‘make time for yourself today, even if it’s only ten minutes’. To me, The Practical Guide to Healthy Caring is an excellent and accessible resource for older carers, full of practical and genuinely helpful advice. But much more importantly, what do carers think about it? I can certainly give no higher recommendation than that.